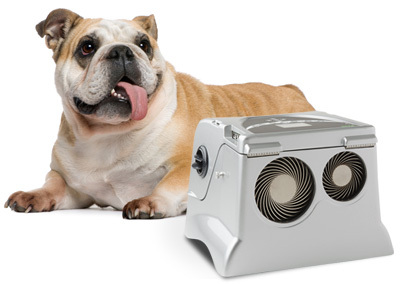 Adamfresh Smart is the first evaporative cooler featuring the concept of calibrated ventilation to obtain improved maintenance of the fresh air it produces. 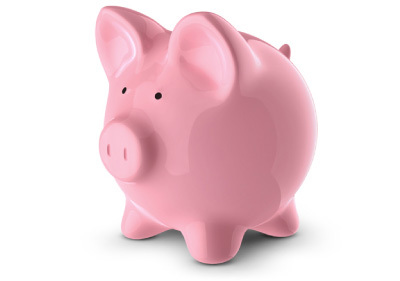 If we set ventilation weaker or stronger than needed considering our location, we will not obtain the expected benefit. The fresh air flowing from the vents tends indeed to mix up with the environment’s hot air before reaching us. Thus, if not managed properly, it loses in efficiency. Thanks to the calibrated ventilation technology, it is possible to orient with precision the fresh air in the right spot and optimise the maintenance of the air temperature. No more pointless dispersion of fresh air: with the calibrate ventilation today it is possible to avoid waste and maximise efficiency. Calibrated ventilation: the right stream at the right distance! It provides a perfect ratio between the speed of the fresh air stream and its efficiency on people, specifically designed for the dimensions of caravans and motorhomes. Setting the device is very easy: you only need to measure your distance from Adamfresh Smart, select the corresponding speed and get your unpaired benefit! 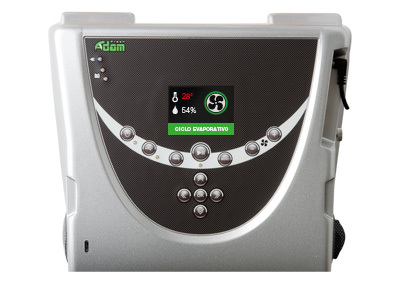 Adamfresh Smart offers just one universal programme designed for easy and immediate use in any situation. Every accessory of Adamfresh Standard model may be purchased separately and then applied to the Smart model. The evaporative freshness at the lowest consumption in its category! Consumption ranges from 1 to 2.5 Ah (with 12 Volt battery), for a total power of 30 Watt at the highest speed. The temperature of the air flowing from the vents depends on the level of relative humidity in the environment: the drier the environment, the lower the temperature. In normal conditions, it is possible to obtain air temperatures, measured at the vents’ output, which vary from 1 to 7°C lower than the temperature of the environment. Sound pressure at a two-meter distance is 65dB averagely – considering the different speed modes. Figures in the table are obtained from testing with a digital sound level meter in a home environment. Within a three-meter range from the vents, you will be reached by a refreshing and pleasuring air stream: you will need nothing more than this to beat the summer heat. In the table, you may find the recommended speed according to your distance from Adamfresh Smart to get the highest performance from its calibrated ventilation. The tank contains about 2.7 litres of water. Average consumption is o.35 litres/hour. Estimated range with a full tank is 8 hours approximately. Range varies according to the relative humidity of the environment and may undergo significant variation if used in desertic or arid climates. Adamfresh is none of these, rather it is a water freshener that produces a cool breeze, contributing to the natural wellness of the people under its air flow. It does not require any intake connections outside the vehicle, Adamfresh is self-managed giving maximum freedom of movement and can be placed anywhere. 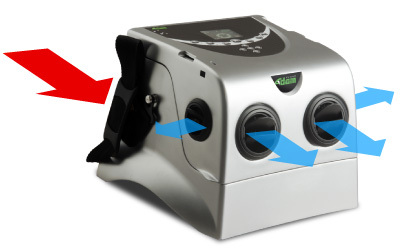 Adamfresh, thanks to its fan, runs hot air over a water-saturated cellulose fiber filter, generating a beneficial flow of cool air exiting its vents. It can be powered with 230 Volt or 12 Volt, or even its integrated rechargeable battery without an electric power connection. High-tech, thanks to its programmable electronics, it is always useful. Adamfresh requires limited maintenance and no expert technicians are required to perform it. Just replace the filter when it is used and this is done simply by opening the cover. No tools are required, use one hand to remove the old filter and the other to insert the new one. 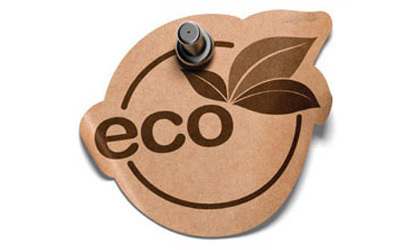 Adamfresh is a completely ecological, environmental friendly product! Use water to cool, not gas. The cellulose fiber filter can be disposed of as if it were paper. With limited weight (6 kg when empty), it has a side handle for easy handling. It has an appealing practical design. 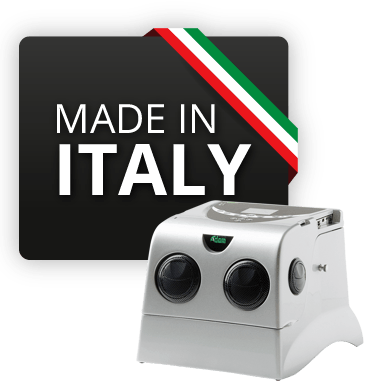 Adamfresh is a product with an all-Italian story: idea, design, construction, technology, electronics, software, and assembly are all products of Cablofil, located in Mantua. In the international market for more than 40 years, Cablofil is specialized in the production of electric components for cars and industrial equipment.